Everyone Has a Story: What’s Yours? Yesterday was a good reminder. I was reminded of patience, joy, trust, fun, and the thrill of learning something new. 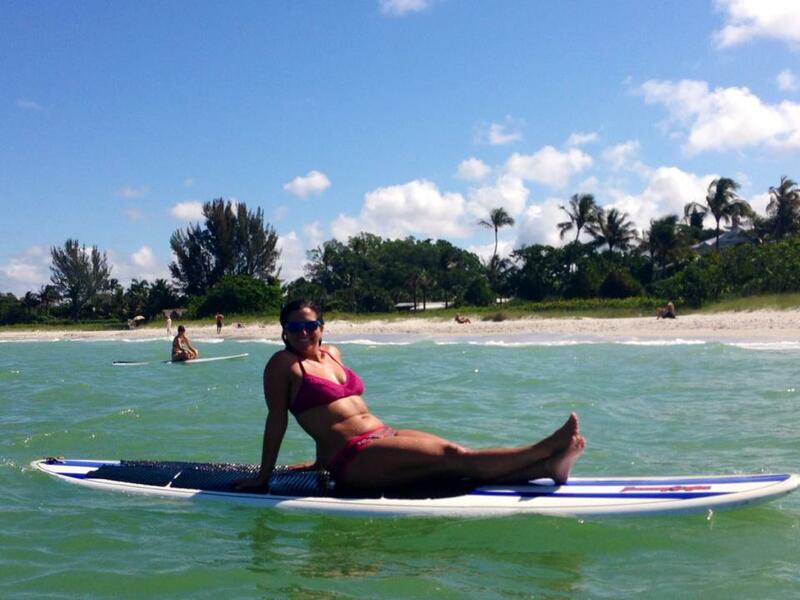 I went to my first SUP (standup paddle board) Yoga class. I’ve been on a paddle board a couple of times—on a pond—but despite a dozen years in a state with some of the best rivers and lakes, I never learned much about wielding a paddle. Don’t get me wrong—I enjoyed many long river days, but was content in my role of handing out snacks and beers. But that’s a different story…. The Gulf of Mexico isn’t known for its waves. As far as Florida is concerned, the surfing is on the Atlantic side, but there is surfing here too—mostly during hurricane season and cold fronts—but occasionally the wind is just right and we get a little swell. Yesterday was one of those days. Ok, swell might be an exaggeration, but we had some rollers. The three seasoned SUP yogis had been cruising around on their boards for a while, and when it was time to go I pushed my board into the water, hopped up on my knees and started to paddle. The instructor’s voice came behind me, “You’re a natural!” Then I laughed, tried to stand up, and fell. The other newcomer, who I later learned is a yoga professional, took her time getting started. I don’t know what she was thinking, but I guess it had something to do with wanting to feel confident on her board so she’d be better able to practice the poses she knows so well. Me: I just wanted to get the party started. Jill Wheeler is the wife of a high school friend of mine and the leader of the class as well as many others she offers through Wellfit Institute. She offers wellness coaching, therapy, adventure travel and workshops. She’s definitely a badass with a wide smile and infectious exuberance. You get the immediate sense that some of that will wear off just by being near her, and after ninety minutes playing in the water with her I can confirm that it’s true. Many of us connect to ourselves through nature, and Jill and I both fall into that camp. We don’t necessarily do it in the same ways—she’s more of an athlete, while I’m more of a feel my toes in the sand and the water on my skin and the wind in my face kind of girl—but sometimes there’s sameness in the difference and we both know one thing to be true: nature and movement are what help us keep it together when things seem to be falling apart. Or, in a more perfect world, what we use to prevent the seams from coming undone. I have never in my life been as challenged as I have been writing this book, that has a new working title recycled from a previous (unfinished) book: NOT WHAT I SIGNED UP FOR. I joke that I’m the toughest boss I’ve ever had, and I’m not even close to kidding. I’m relentless, ruthless, critical and sometimes downright mean. I have everything I need to be successful, yet I still sometimes manage to get in my own way. If I had a choice I probably wouldn’t work for me. I have a solid 96,000-word draft of a book, and a perceptive editor who gave me some terrific advice and a decent road map that I can use to guide me in my rewriting. He seems to understand me and suggested I do a quick rewrite. He didn’t say it in these words, but the implication was there: Don’t agonize. You’ve got this. Sometimes I sit in front of the computer twirling my hair, and I wonder why my mind spins in a million directions as if I have nothing to work with, as if I’m starting from scratch. I worry if I have too much material and what I can do to skim some off the sides and create a more manageable manuscript. I worry that I’ll never get this done. I worry about what happens if I fail. I worry if I suffer from a Jonah Complex, or a fear of success. “So often we run away from the responsibilities dictated (or rather suggested) by nature, by fate, even sometimes by accident, just as Jonah tried—in vain—to run away from his fate”. I came to Naples for cutting, revising and adding a few additions to the book. I didn’t expect to like the place, but have been pleasantly surprised by the nature here—the proximity to The Everglades, the Gulf, the abundant wildlife—yet I struggle with some fundamental things about the place. If I’m being real here, and that’s the point, my struggle most likely has more to do with the rising tide within me than with geography, but it also has something to do with being able to connect to a place, and this place is so, so different from the Rocky Mountains I’ve called home for most of the past dozen years. So we change perspective a bit: big whoop, right? Yesterday it was clearly time to dunk myself into the water. It was time to learn something new and to connect with the nature that’s here. It was time to feel like a ten year old. The summer between my junior and senior years of college I moved across the country alone to work on my thesis project. I chose Hood River, Oregon (for a magazine internship) and learned to windsurf while I was there because it was available and because I tend toward a “When in Rome” attitude. I found immense joy in that “mind vacation” as a twenty-one-year-old, and I hoped that I could tap into it again as a thirty-nine-year-old. 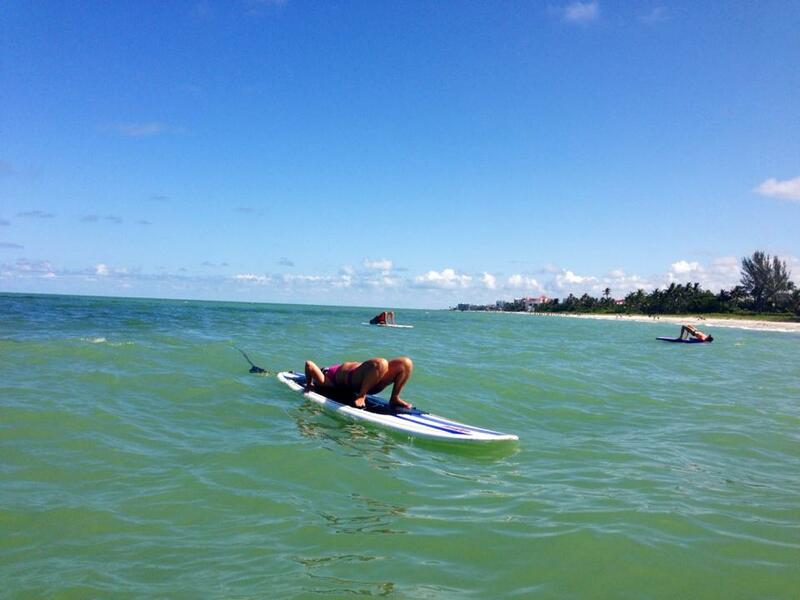 So finally, yesterday, I took Jill up on the offer to join her SUP Yoga class. And here’s the good news: it worked. It absolutely exhausted my body, which I’d taken to the gym the night before and given a run for its money. I didn’t realize how fatigued and muscle-torn my quads and shoulders were until I was on the board paddling, but after a few strokes I forgot. I also forgot about the stress of writing and focused on the simple act of moving through water and balancing on the board. I’m a decent yogi because I have natural flexibility, but I was not given the gift of balance. Strength yes, balance no, but the only option is to work with what we’ve got. Yoga on a moving object was not going to come easy to me—I knew this—but every time I fell off the board I smiled inside and out because I knew it was a direct result of will and effort. And sometimes, despite those things, we fall. Hoisting myself back on the board time and again I was glad to have the strength and will to do it. I didn’t get hurt, though I did bump and bruise a knee one time. The reason: I tried to stop myself from falling when I should have just let it happen. Lesson learned: submit a little. I’d cried on the way to SUP Yoga and on the way out, but I didn’t cry during. I’m going to quote Jill again, “Nature has a way of just being without attachment to outcome, without apology for being real. Nature levels the playing field–for everyone.” I’ll add that nature and learning something new in the constantly changing environment of moving water levels our internal playing fields. Taking this lesson off the board is the next challenge, but if we can then we’re definitely winning. I didn’t go back to SUP or yoga or even the gym today, but after writing this morning I did go back to the beach with a friend to read, rest and reconnect. It’s good for my writing and I’m getting to the point where it’s not necessary to apologize for doing what I know will work, when sitting in front of the computer and twirling my hair for too long clearly doesn’t. Learning is winning. Jill took a picture of me trying to get up into Urdhva Dhanurasana (AKA wheel or backbend) on the board, and then another one of me after Shavasana (AKA corpse pose), the only yoga pose I never forget the name of. It’s the one where you lie back, let it all go, and experience gratitude. Shame is a real crippler, and embracing it does nothing but breed more of the same. On my journey of trying to feel less of it I choose disclosure as the antidote, so here’s a picture of me either on my way into or out of wheel (does it matter?) and another, sitting happy, Buddha belly and all, at the end of the session, fresh out of Shavasana. Your writing is so good Jaime!! Better and better. I love this post, and I love your belly to death. You are the best. My writing, my belly and I love YOU to death! Oh girl. I’m so glad you got to try SUP yoga! I find god/myself in nature, too. Thanks, Steph. What a nice compliment! I think we’re all encouraging each other to be better and try harder, and I’m glad I can be a motivator for you. I adore your writing…what is it you think you’re missing? you know what: it is ALL ok. keep doing what you do and you’ll get where you want to be. One day (word) at a time, you know?